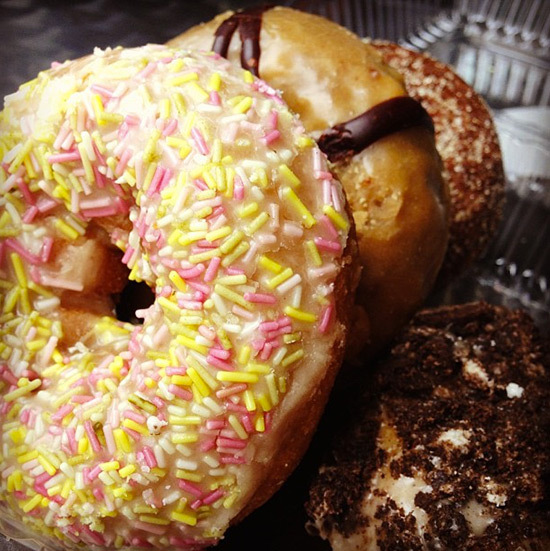 Fresh hot donuts made right in front of your eyes? 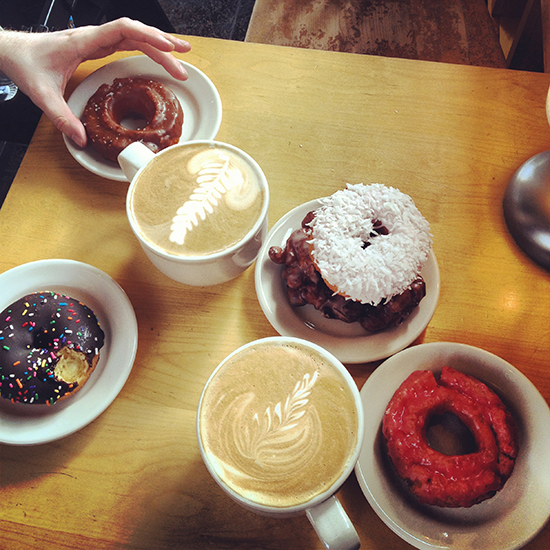 Welcome to happy morning deliciousness. 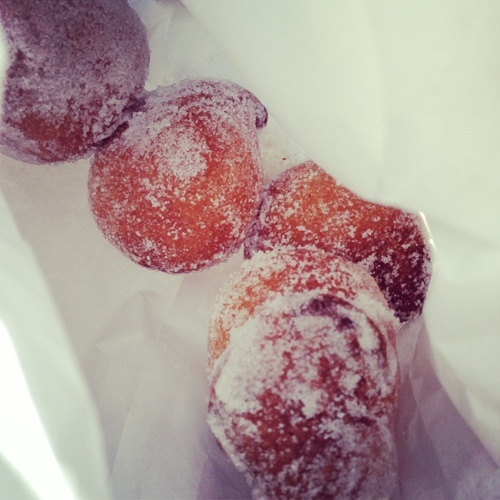 These fluffy, sugar dusted treats from Dumont Burger are worth the trip even if you’re not nearby, just be sure to get there before 11am. At $3 for four and $6 for nine, they’re also a steal for a breakfast so fresh and tasty. There are several sugar flavor options. We tried lemon which was lovely and subtle. Our recent visit to Block Island was a blast (more info coming soon). I expected a great time with the family, the ocean, and seafood but was surprised to come home raving about donuts and pies. Aldo’s Bakery supplies the pies – we had an excellent blueberry one with a buttery crust that was heaven a la mode with their homemade ice cream. 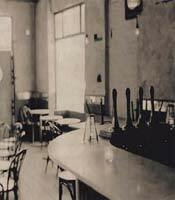 The true gem though, are the fresh “killer” donuts from Payne’s in the New Harbor. 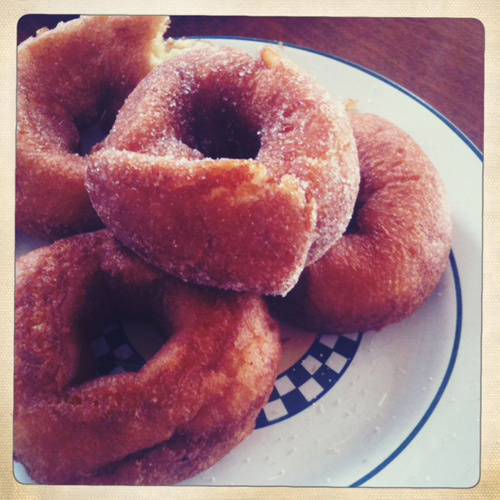 Now, I have had many a great donut in my time, but these warm, sugar dusted treats rank among the top five at least. I had three(!) in one sitting, truly living it up when on vacation. These are so addictive that they could make anyone fat within a few months, so it’s a mixed blessing that they aren’t available closer to home. 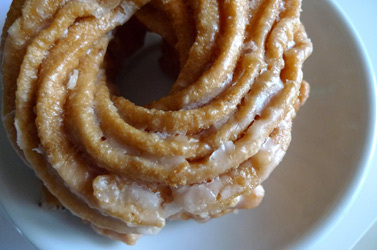 In honor of the recent Donut Day, I honor the best donut of all – The French Cruller. 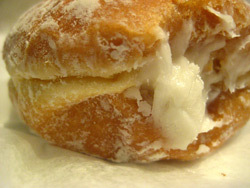 I love the glazed, or as my and Tina Fey’s favorite donut shop Peter Pan calls them, Honey Dipped. One of life’s best indulgences. Look I may not be the skinniest miniest in the room but I'm no orca and to be honest, it's kind of amazing considering the stuff I used to eat. Dunkin Donuts features these tasty treats called Kremes : take one powdered sugar donut and stuff it full of really, really sugary icing. I used to eat two, count them two of these for breakfast as a teen. Good lord.. I decided, despite the possibly hairy eyeballs from kids who thought I was betraying my beloved Peter Pan Bakery, (recently endorsed by Liz Lemon) to head over to the local Dunkin that displaced Greenpoint's only good Thai spot a few years back and try this treat once again. The adorable polish kid who (as I overheard), was nice enough to take Anna's shift yet again, informed me that there was only one left. I am lucky, because according to bloggers, some states have discontinued the vanilla kreme indefinitely. Apparently a three hundred and forty calorie breakfast bound to give you cavities is a local favorite. It wasn't quite as stuffed with icing as I had remembered as a kid, I blame the economy and Dunkin cutting corners, but despite a cry of protest from my tummy, I have to say, it was still good in a very, very guilty way. I guess that;s a weird assumption. But anyways, the grilled donuts are worth the special trip.